Every year on the first Sunday of May, families around the world gather to celebrate motherhood. 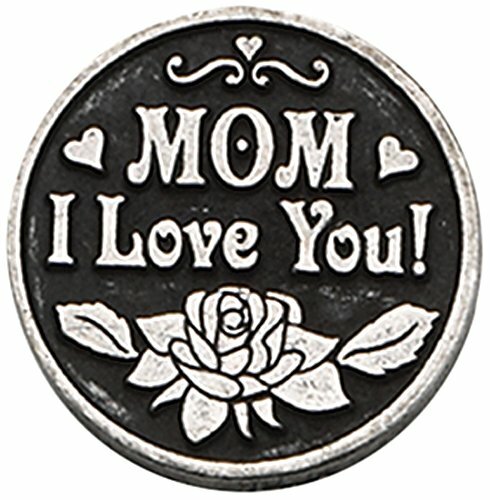 For those of us who are lucky enough to grow up basked in the unconditional love of our mothers, we make good use of Mother’s Day by getting our moms a little something to let them know that we love them. Or perhaps you are a husband (lucky wife!) who is looking for a Mother’s Day gift on behalf of your kids. In either case, you will find plenty of really cool gift ideas in this gift guide. 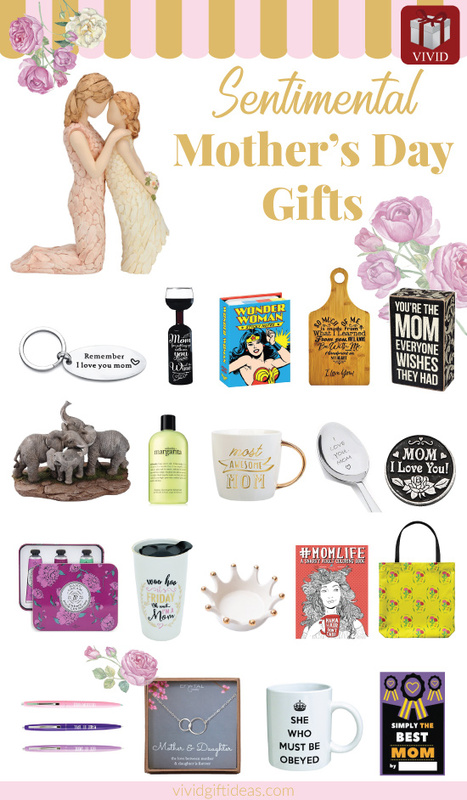 These ideas are curated for Mother’s Day in mind, but they are just as great for other occasions such as mom’s birthday and Christmas. This is not the first time we write about Mother’s Day gift ideas, we also did a sentimental mother-daughter gift guide a while ago. So hopefully we’ll be able to help provide some inspiration. And if you’re looking for thoughtful words to share with a mother, make sure you check out these beautiful mother-daughter quotes which are complete with illustrations — perfect for adding to your Pinterest board! Let’s start the list with this charming necklace for your amazing mom. Features a delicate gold chain with a lustrous pearl set in the stylish disc pendant. This necklace looks simple and elegant. It is arranged on a sentimental keepsake card ready for gift-giving. For the most awesome mom. 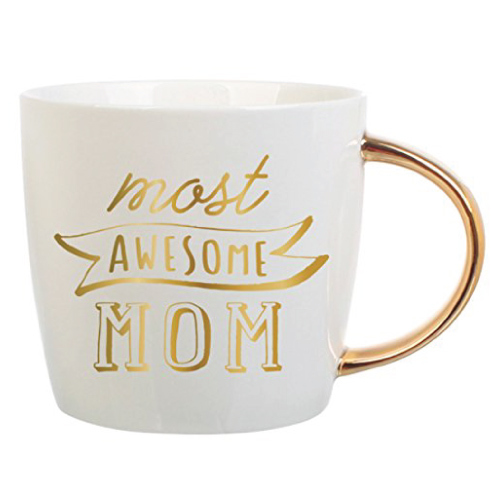 This good-looking mug is perfect for moms who love coffee. 14oz capacity. It has a gold handle to make her feel rich and awesome when enjoying her favorite coffee. A sentimental Mother’s Day gift from daughter. 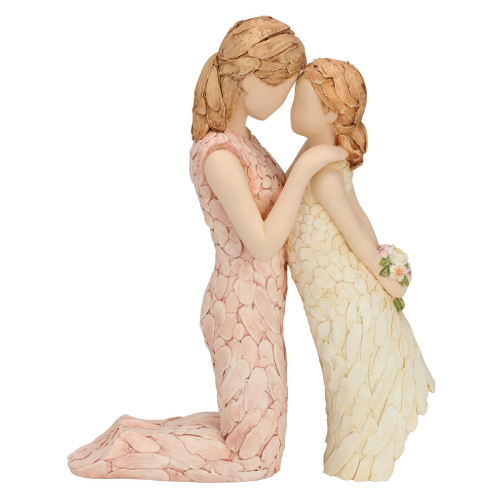 This lovely figurine depicts the close bond between a mother and her daughter. It is beautifully crafted and painted in soft pastel tones. You can also get a nice home decor for her. 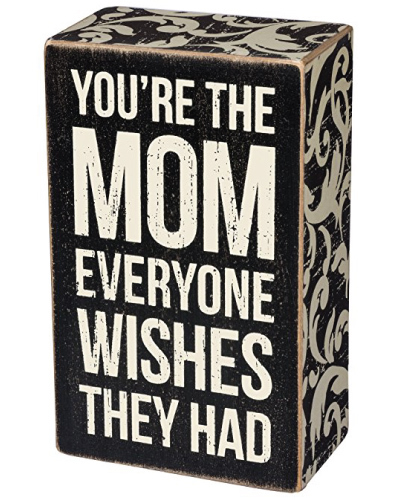 Make her smile with this vintage box sign that reads “You’re the mom everyone wishes they had”. This sign is made of high-quality wood and it is beautifully painted in a distressed style. It is also nicely sized to look great on the bedside table, dressing table, or in the office. 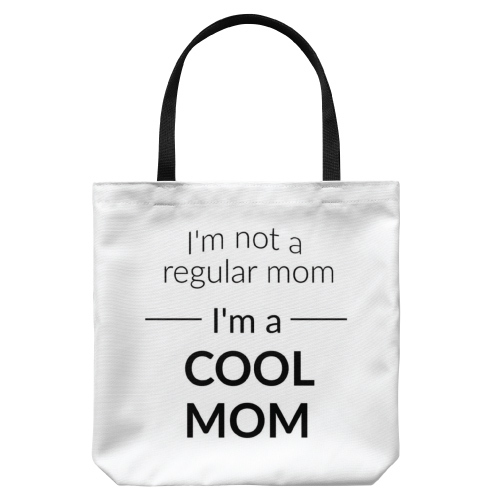 A black and white, stylish fabric tote for the cool mom. 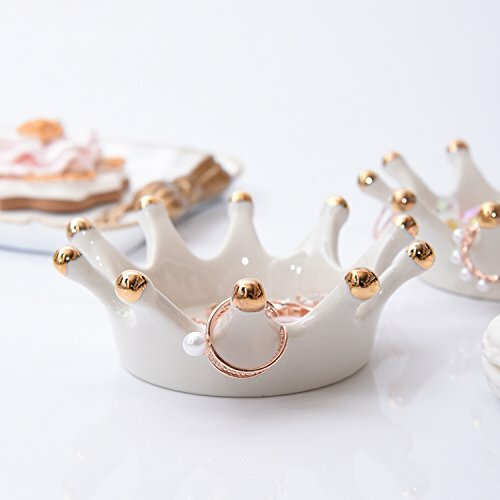 A ceramic crown for the queen of your life. It is an adorable dish to place your rings, earrings and other small gems. 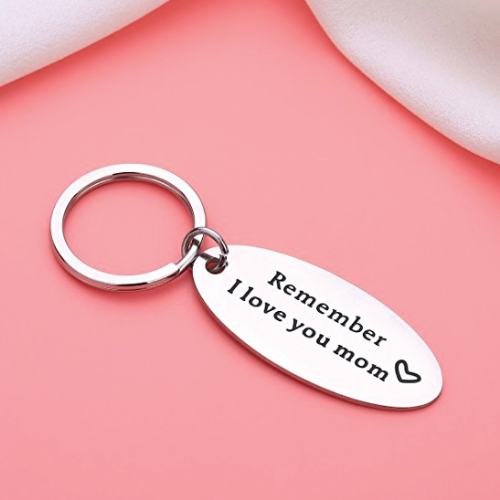 An inexpensive Mother’s Day gift under $10 — a solid stainless steel keychain to tell your mom how much you love her. 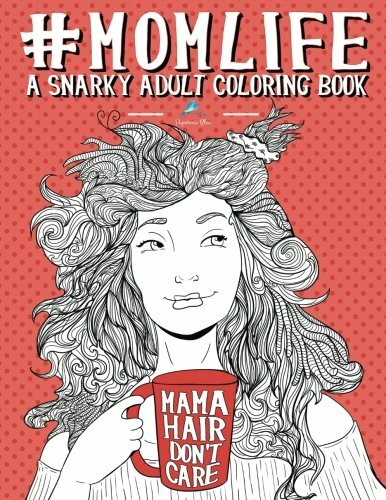 This cute coloring book makes one of the best gifts for moms with small kids. 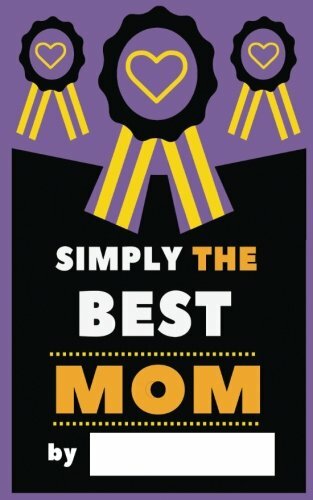 It is filled with 30 snarky illustrations that describe what motherhood is really like. Hilarious and fun. Grab the colored pencils and color away from the stress of mom’s daily life. 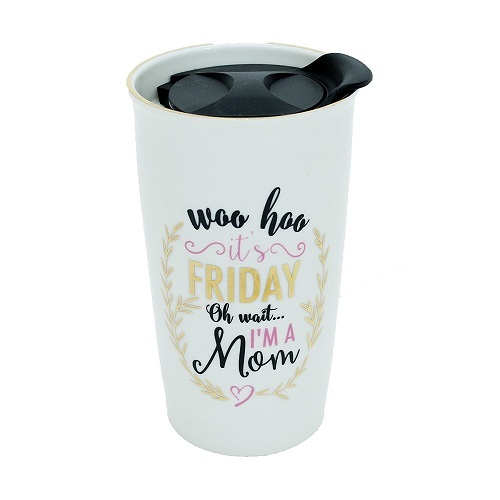 If you are looking for gifts for working mom, this travel mug is a wonderful choice. It is made of solid ceramic with a cute design. It says “Woo hoo it’s Friday. Oh wait… I’m a Mom”. This statement is hilarious but true as we all know that a mom’s working days is 365 days with no holiday. 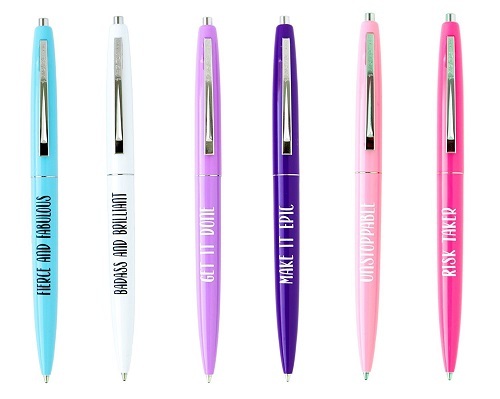 Another great gift for working moms — A set of six pretty pens that glide on smoothly. They are colorful and imprinted with sassy motivational quotes. Brighten up her days, add a little extra color to your mom’s work desk. 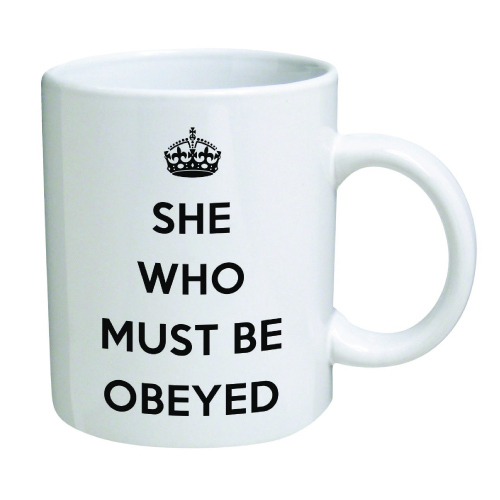 This is for the ultimate ruler in your house. If you don’t listen to her, she might not cook your dinner. She is powerful, she can do everything for you. She is the superheroine in your life. 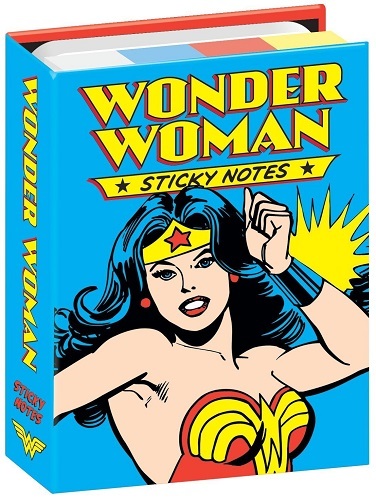 Get this Wonder Woman sticky notes pack for her to write down the heroic acts she needs to perform. 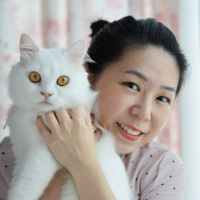 You can also choose a good skincare for mom. 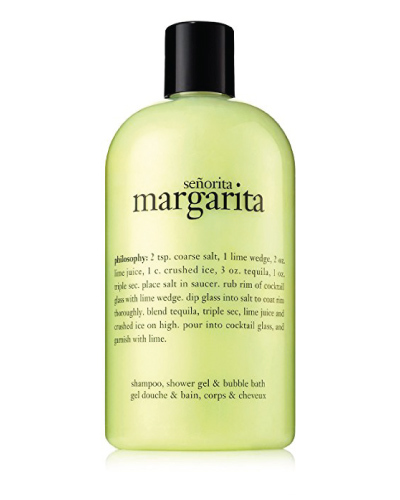 Pamper her with Philosophy Senorita Margarita 3-in-1 shampoo bath gel. It cleanses and conditions skin and hair. Rich lather, moisturizing formula, pleasing citrusy flavor. Use it and leave the bathroom smelling like a margarita! A meaningful necklace in a simple design. 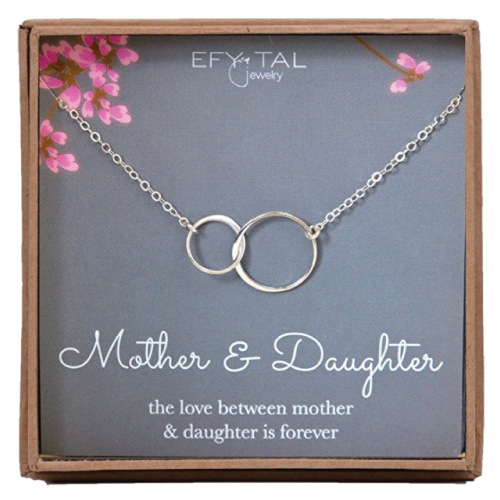 A big circle interlock with a small circle symbolizes the closeness of a mom and her daughter. This necklace looks chic and nice. It is a fantastic gift for mom from daughter. 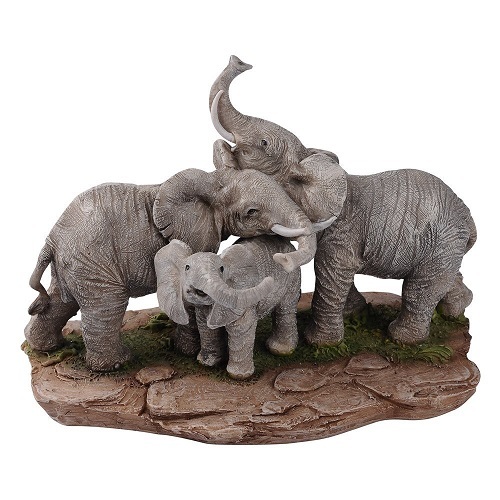 A loving elephant family surrounded by love and warmth. Crafted with fine details, they look absolutely beautiful. The pinnacle of all sentimental mom gifts. Complete this journal with the help of useful prompts. Record the precious moments with mom by describing them in writing. Personalize the journal covered with your imagination! Add awesome stickers or photos or simply sign your name at the bottom in the space provided by the journal. This is just the kind of gift that mom will love to get on Mother’s Day — personal and emotional. Sentimental token to express your love to her. Pocket size, solid metal. It makes an amazing small gift for mom from kids. 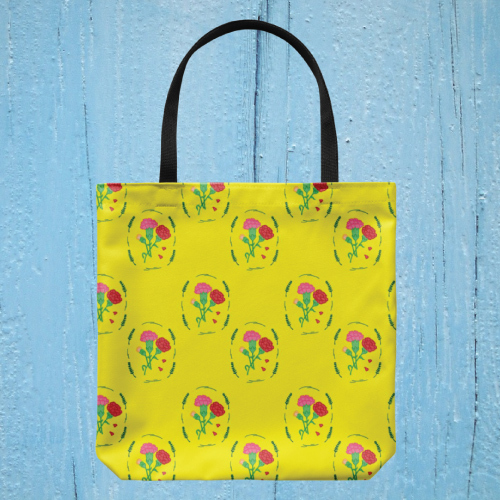 A multipurpose tote that mom can use as an everyday bag, grocery bag or book bag. It has a lovely floral pattern featuring carnation flowers on a vintage yellow background. Large capacity, sturdy and useful. 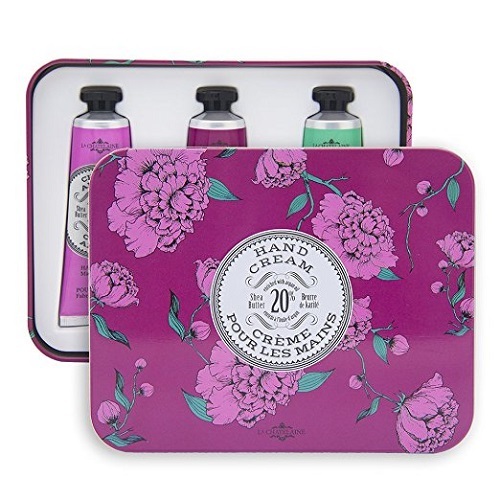 A trio of luxurious hand creams from the South of France. Made from the finest natural ingredients blended with organic shea butter, Vitamin E, and argan oil. They are moisturizing and nourishing for all skin types. 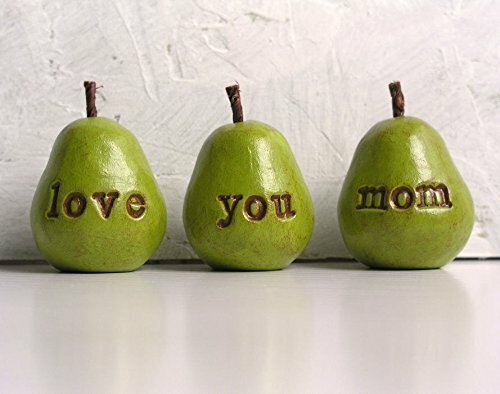 Three of the most darling little pears to make your mom smile this Mother’s Day. Vintage green color, mini in size. 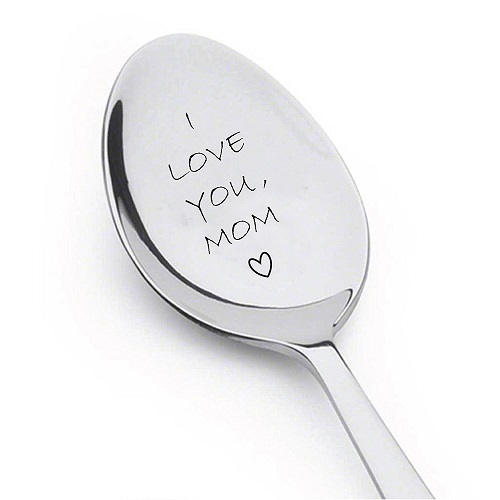 A sentimental gift that mom can use frequently. Practical and cute. 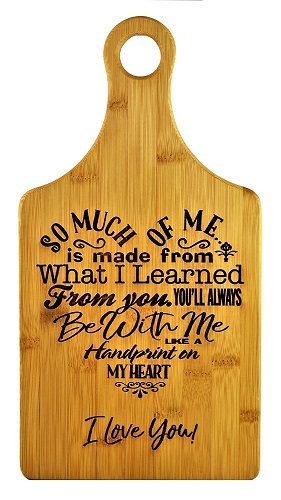 Good quality bamboo cutting board engraved with love poem designed especially for the important woman in your life. The engraving reads “So much of me is made from what I learned from you you’ll always be with me like a handprint on my heart ~ I Love You”. 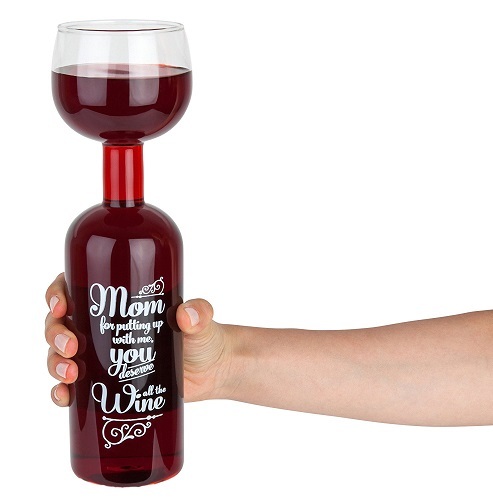 That concludes our list of 20+ sentimental Mother’s Day gifts. Thanks for reading.